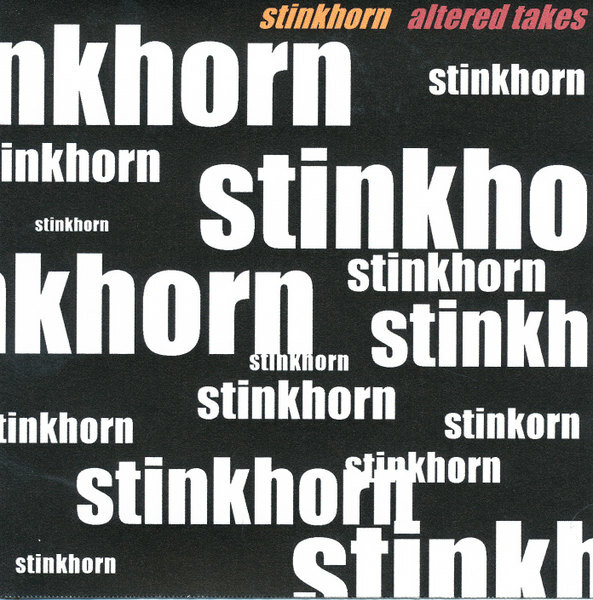 In anticipation of their appearance at the Progman festival in Seattle this summer, Stinkhorn have put together this little teaser of a CD. It contains early versions of two of the highlights of their 1997 self-titled debut CD, plus two previously unreleased tracks from the same time period. In 1994 and 1995, when these tracks were recorded, the band’s personnel had not settled into the current quartet with Brian Heaney on guitar, Michael Monhart on saxes, John Morris on bass, and Howard Ouchi on drums. Kevin Cook plays drums four tracks; Mike Peterson covers the other two. We get two versions of “Fifteen Reasons,” first a 1994 demo version with a more raw sound and different arrangement, then a 1995 live performance with yet another arrangement. It’s very interesting to see this piece evolve from the 1994 demo to the 1997 studio version, and makes you realize how widely the band interprets its own material, keeping some of the basic ideas and altering others. There’s also an early demo version of “Safe Six,” a favorite of mine. Two takes on a track called “Food” are presented, one live and one studio. It’s a great tune worthy of inclusion on an album. “Blue Ives” is the other new piece, features a much cleaner guitar sound than Heaney normally favors, with an off-kilter finger-picking progression, some very quiet sections, a louder section in 5/4, and some good soprano work from Monhart.